1. Quarter the fennel bulbs. Trim the tips and base (keep any little fronds) and remove any coarse outer leaves, if needed. Quarter and core the apples, cut into slim slices and toss in a bowl with the lemon juice. 2. 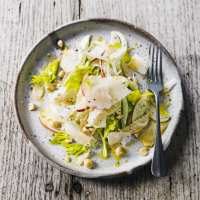 Using a mandolin – it’s the best tool for the job – slice the fennel very thinly and put it into a broad, shallow serving bowl. Slice the celery at an angle and add that, along with any fennel fronds and celery leaves. Add the apples – with the lemon juice – olive oil (to taste), balsamic vinegar, hazelnuts and seasoning. 3. Using a potato peeler, shave the Gouda into wisps and add these too. Toss everything gently together and serve. This recipe was first published in Tue Nov 27 09:46:16 GMT 2018.